All job interviews are not one-on-one. There are 9 different types of job interviews and this infographic tells you what you should expect. Chances are, the last interview you attended, was conducted by one or two people. You've probably also been through a panel interview, and a few second interviews. However, most job seekers do not know that they should prepare for less common types of interviews too, including a phone interview, a group interview (where you're one of many candidates at the same time), a testing interview, a lunch interview, and a stress interview. 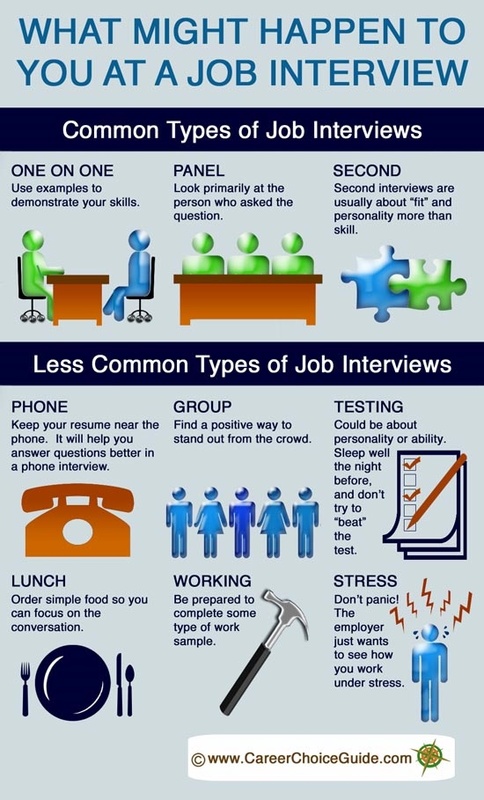 This infographic explains how best to approach each of the common and less common types of job interviews.